The last step was to put everything together! The team did a great job of finishing the paper, getting results from the user study, and adding finishing touches to the UI. The end product looks like this! Week 29: More Frontend Work! For this week I focused more on frontend work. 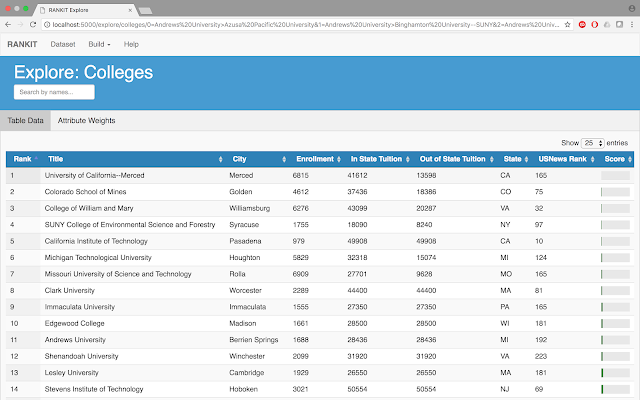 The graduate student, Caitlin, updated the backend code to send the score of each ranking. Previously, the score was filled with dummy values to simply get the frontend functionality in place. And move the entire column to a more intuitive place. Furthermore, I also worked on updating our datasets to be better. 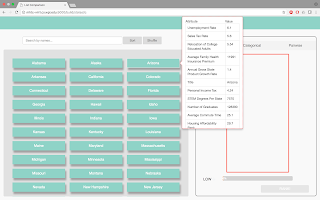 For one, our States dataset had unintuitive attribute values. To change that, I updated to a new dataset and looked for a better movies dataset, a one that would include categorical attributes. Unfortunately, I could not find a dataset that had as much variety of attributes as the current movies dataset has and that has categorical attributes. Last week, we had our spring break, so there's no update.